Utterly disgraceful display of contempt for democracy in the UK Parliament yesterday, when one single pro-animal circus MP, Conservative Andrew Rosindell, blocked the second reading of the Wild Animals in Circuses Bill 2014-15 (a Private Members’ Bill) to end the use of wild animals in circuses. The Romford MP’s objection to the Bill flies in the face of the will of 95% of the British public, of 63% of Members of Parliament, and the Government’s own promise that it wants to see an end to the suffering of wild animals in circuses in the UK. 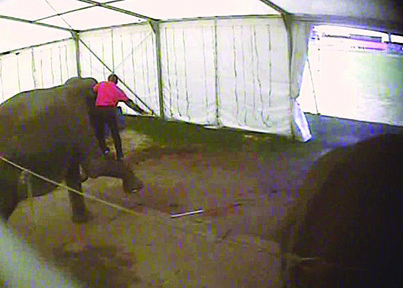 Mr Rosindell has been a champion of the now defunct Great British Circus, where ADI exposed shocking abuse of performing elephants by their trainers and keepers and used the rules of Parliament to block the progress of the Bill to the next stage, with his single objection. The Bill, sponsored by former minister Jim Fitzpatrick MP, follows the exact language of the Government’s own Wild Animals in Circuses Bill, which, although ready to place before Parliament, the Government has failed to progress. Mr Ronsidell was able to use the rules on Private Members’ Bills to impose his minority viewpoint over the majority because just one objection can block progress, as such Bills are not official Government business. Speak with Liz Truss MP, Secretary of State for Environment Food & Rural Affairs and the minister, Lord de Mauley – urge the Government to support this Bill or schedule time for its own Bill to ensure it passes before the General Election in 2015, fulfilling the Government’s promise to the public. This entry was posted in Uncategorized by animaldefendersinternational. Bookmark the permalink. It is pity that Andrew Rosin dell blocked the 2nd reading of the wild Animals in circus Bill 2015.